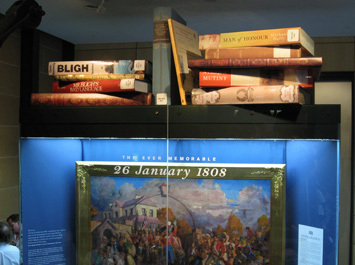 In Sydney, on January 26 1808, William Bligh, Fellow of the Royal Society, Captain in the Navy of His Majesty George III and Governor-in-Chief of the Colony of New South Wales, was forcibly deposed by officers and soldiers of the New South Wales Corp, and placed under house arrest in Government House, on the site of the current Museum of Sydney. Tagged the “Rum Rebellion” by later commentators, the bloodless coup arose from a series of circumstances and conflicts stretching back to the first days of the new colony in 1788. 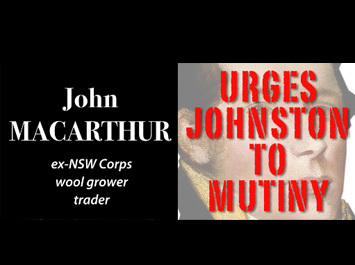 To commemorate and interpret the 200th anniversary of Australia’s only military coup, the Historic Houses Trust of NSW invited me to conceive, develop and produce a series of exhibitions and events. 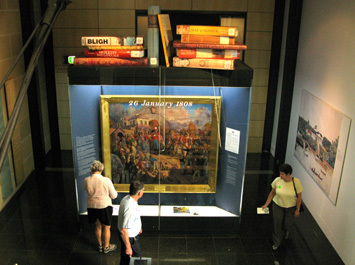 A large free-standing showcase houses the exhibit. Visitors can walk around the four sides. The front of the showcase presents a large fanciful history painting made in the early 1900s by artist Raymond Lindsay depicting the coup. A collection of oversized books relating to the coup sit on top. I commissioned artist Kassandra Bossel to fabricate them, to represent the weight of history and the continuing debate over motives, influences and causes. On either side of the case, the stories of the two main protagonists is told. 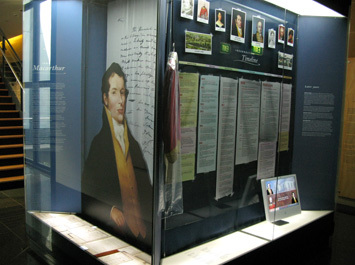 At the back is a timeline of events, intended to demonstrate the complex social, political and economic tangle that was Sydney in 1808. 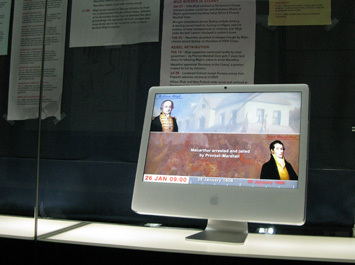 An iMac computer displays a detailed animated version of the timeline. A soundscape by David Chesworth of Wax Sound Media evokes early Sydney town and, more abstractly, the sound of men sitting and writing. On the top floor of the museum is a glass viewing cube. It provides visitors with a plan view of the early 19th century buildings, depicted in stone tiling on the plaza below. At night, imagery can be projected on the walls of the cube. Naturally, people moving by in the street below don’t spend much time looking up at the building, so any media presence needs to be immediate and captivating. ‘Rebellion’ is a short animation outlining the key dates and players of the coup. 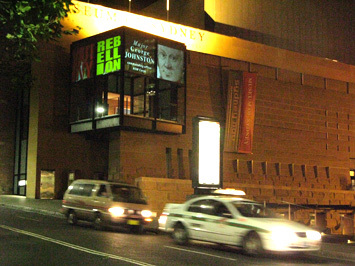 It alerts passers-by to the imminent 200th anniversary by emphasising the dates – 26 January 1808 and 2008 – and the site – the Museum of Sydney is EXACTLY where the coup took place. 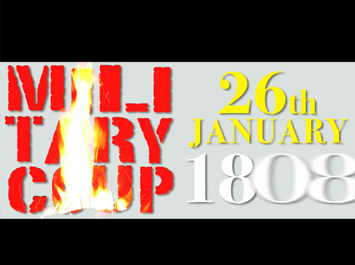 It is sheer coincidence that the contemporary national day of celebration falls on the same day as the 1808 coup – but it provides a strong backdrop to explore and revisit the machinations leading to and resulting from the coup. 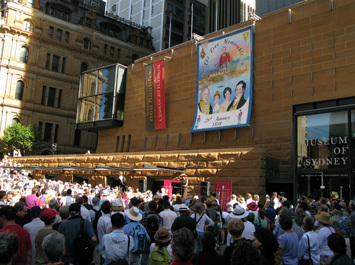 The HHT wanted a performance event to play to the crowds of people in the city on Australia Day 2008. I proposed a human tableau copy of the Raymond Lindsay painting displayed in the showcase exhibition. Members of the Australian Napoleonic Association performed on the day and made new costumes to match those in the painting. Author Tom Keneally narrated a script I wrote which gradually introduced the protagonists and explained the background. 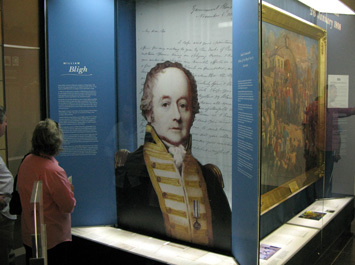 The character of WIlliam Bligh peered down from the viewing cube. 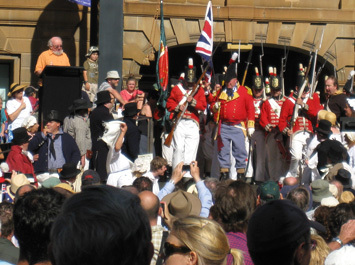 A squad of armed ‘redcoats’ marched onto the plaza, with fife and drum playing as reported to have happened in 1808, and entered the Museum of Sydney. The redcoats then joined the other players on the plaza steps to form the tableau. At the climax of the story, fireworks exploded and a huge hand-painted banner unfurled down the Museum’s facade. The current Governor of NSW, Dr Marie Bashir, then gave a speech about the coup and the huge crowd was again invited into the museum.